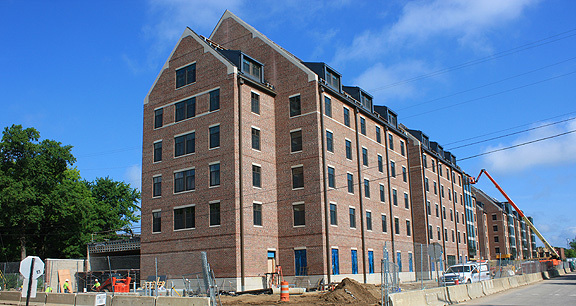 Project obstacles and solutions: Purdue University broke ground in January 2015 for two new multi-use residential halls connected to their Honors College program. The North and South Honors College buildings were designed to create space to house up to 817 Honors College students. The unique design combined 320,000 square feet of residential space with classrooms, labs, study rooms, recreation rooms, academic offices, and a 400 seat Honors Hall Auditorium. The main floor also included retail space open to the outside streets. Messer was selected as the general contractor for this project. F.A. Wilhelm Construction provided all of the structural concrete work on the two six-story buildings. J.R. Kelly finished the upper floors. J.C. Ripberger Construction finished all of the exterior concrete hardscapes. The building of the Honors College facilities impacted more than just college student housing options at Purdue. This unique combination of academics and residence in the same buildings was new to the university. It was designed to foster a community of high achievers and to grow the Honors Program. There was a lot of anticipation, which tended to push the contractors to over-achieve on the construction schedule. From the first shovel of dirt turned at the site to turnkey operations, there were 20 months for construction. That schedule was firm. Wilhelm poured and finished 9,000 yards of concrete for the two buildings, including foundations and floors. Ripberger finished 1,400 yards of sidewalks, steps and driveways. These included colored concrete strips and decorative saw cut patterns in the concrete entryways. Part of the Honors College program allows students to be innovative and help shape their experience. This included building space that could accommodate a wide variety of creative exhibits. The Innovation Forum is a student-led initiative that exhibits in the entryway of the North Building. Messer built some flexibility into this entryway. It was designed with sliding doors that were wide enough to allow a small airplane to be rolled into the building. This also called for engineering the floor with a concrete mix that would structurally support potentially heavy displays. The Purdue Honors College buildings were opened in time for students to move in for the 2016 fall semester. For more information on strength in concrete, contact the sales representative for the concrete plant nearest your location. Click here.